Trope is one of the more compelling experiments with literary production in the virtual environment of Second Life. Visitors to the conVerge island are able to explore the variety of landscape and architectural designs, read text presented in the form of books and a floating geometric maze, and enjoy a fireworks display. The significance and appeal of the project derives from the creative use of an increasingly commercial platform, thus blurring the lines between aesthetics and instrumentality, work and play, education and entertainment. Author description: Trope creatively intervenes in the ways that readers engage with literary texts by creating a virtual environment that is conducive to and assists the experience of reading the poetic text. The physicality of the text itself is key. Poems and short stories are repositioned rather than illustrated in spatialized, audio and visual format/s not possible in "real" life. In the trope landscape, Second Life users can negotiate their own paths through each creative environment and for example, fly into a snowdome, run through a maze in the sky, listen to a poem whispered by a phantom pair of dentures, or stumble upon a line of dominos snaking around the bay. 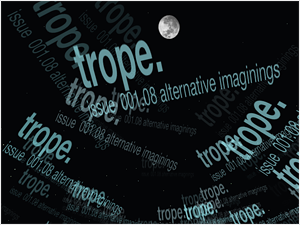 Trope aims to expand writing networks and further develop the virtual literary community. Previous publication: Trope is supported by the Literature Board of the Australia Council for the Arts, and the Narrative, Discourse and Pedagogy research node and the School of Communication Arts at the University of Western Sydney. Writing by Kevin Gillam, Keri Glastonbury, Ash Hempsall, Matt Hetherington, Sara Knox, Alicia Sometimes, James Stuart, Louise Wakeling, and Fiona Wright.